after visiting ryan's family for his grandmother's funeral this past weekend, we came home with a bag of gorgeous fresh beets from ryan's aunt and uncle's garden. let's just take a moment and pause to think about how glorious it would be to have a garden to grow beets like that. yum! i put the beets to good use as soon as we got home. i made crispy baked beet chips (which are way better than potato chips in my opinion) and i also made this incredible quinoa dish for dinner with roasted beets. roasting beets in the oven with a little olive oil, salt, and pepper makes them so delicious. yes, your hands will temporarily turn pink from peeling and dicing the beets, but it washes off eventually and it's worth it for the end result. 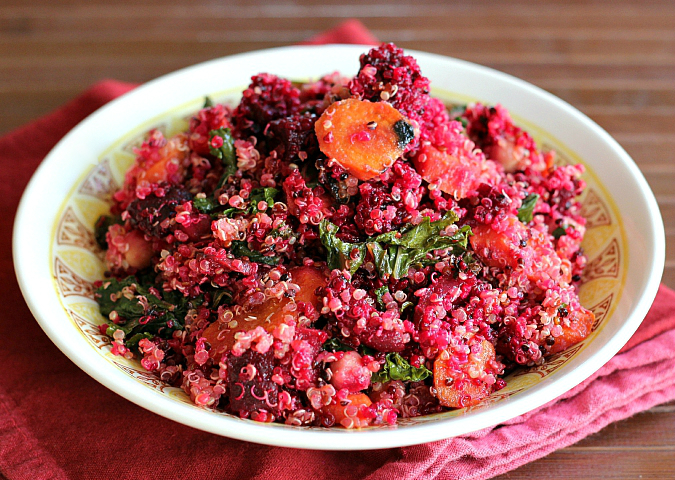 beets and carrots roast together in the oven until they are soft and tender, kale gets sauteed, and then everything gets tossed together with chickpeas and orange dressing. it's a light and refreshing dish that can be served either as a side dish or as a main meal. it is loaded with great vitamins and nutrients. we ate this for dinner all week long. it is good hot, at room temperature, or cold. i just love dishes like this! thanks for the wonderful beets, uncle ed and aunt sandy! preheat your oven to 400 degrees F. wash, peel, and dice the beets and carrots. (dice the beets into smaller pieces and the carrots into larger pieces so that they cook evenly). line a baking sheet with aluminum foil and grease the foil with 1 tablespoon of olive oil. place the diced beets and carrots on the baking sheet, drizzle an additional tablespoon of olive oil over the vegetables, season with salt and pepper to taste, and toss to evenly coat. roast for 25-30 minutes, until the vegetables are tender. once cooked, remove from the oven and set aside. meanwhile, combine the quinoa and water in a pot and bring to a boil. reduce to a simmer and cover to allow the quinoa to absorb the water (about 15 minutes). once all of the water has been absorbed, remove from the heat, fluff with a fork, and set aside. heat a large skillet with the remaining tablespoon of olive oil over medium heat. remove the stems from the kale and chop the kale leaves. place the kale in the heated skillet and saute for 5 minutes. season with salt and pepper to taste. once cooked, remove from the heat and set aside. to make the dressing, combine the olive oil, orange juice, vinegar, and agave/honey in a bowl and whisk well to combine. 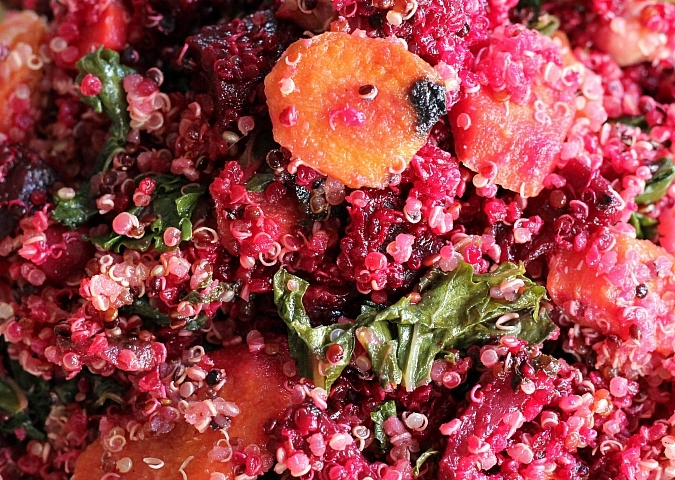 to assemble, combine the roasted beets and carrots, the cooked quinoa, the sauteed kale, and the chickpeas in a large bowl. pour the dressing over the mixture and toss to evenly coat everything. serve warm, at room temperature, or cold. That looks very good. I would like to try that. Pretty salad also.